Do you see the new ribbon to my collection?? Of course not, as it is the size of my index finger. My quilt came home from the Vermont Quilt Festival yesterday, with of all things, a first place ribbon. Since when is a first place, 96 points, deserving of a 4" high ribbon? It's so small it is just silly. Someone oughta protest, and question what our $25 entry fee was for. Like how much can a respectable ribbon really cost??? Enough ranting. I should just be happy that it is blue this time. I was starting to have the "always a bridesmaid" feeling. The quilt got a 2nd at MQS. And I heard through the grapevine that someone thought it had a 2nd place at VQF too. It was nice to see the blue ribbon and the kind judges comments. 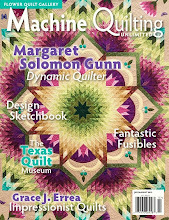 It makes me excited to have it go to the Maine Quilt Show next month. So, here's a couple scenes of my garden - the front one (since the back one got dug up prior to the renovation). It's full of color. The Shasta's are huge this year. I'm just beside myself. Don't try to console me and tell me she'll look cute once it is properly cut. I have one daughter and I love that she wants to look like one. Now she's just a reminder of my ill-mannered sons. I'm mad, sad and angry today. Yes, you are right. We have all done this. Even I did, many times. I have my 1st or 2nd grade school picture as a cruel reminder, complete with hacked up bangs down to the scalp. I have had a few hours to cool off, stop hollering at my son, realize that my daughter most definitely did have a hand in this event. Let's face it, she could have screamed or ran away and she didn't. We have been to get a haircut, or more likely a "hair sort of evening". It was SO much more hacked on one side that it was hard to just straighten out Bryce's handiwork. I am still mad. Nobody asked me if this was OK. If she came to me and asked for haircut, I'd have at least had the time to think about it and talk to her about it. I see this from a Mother's perspective. She's my baby, and now she no longer looks like a baby. I know she'll grow up. But I just wanted the time to process that fact before I no longer had my baby-face to look at ever again. The Maine Quilt Show is only a month away. While I am readying my 2nd quilt for this show, I thought I'd show a sneek peak of another quilt I have done this spring for a customer that will be at the show. It's a lovely hand-applique wall-hanging, and I expect it will score well with the judges. Her applique is seriously gorgeous. 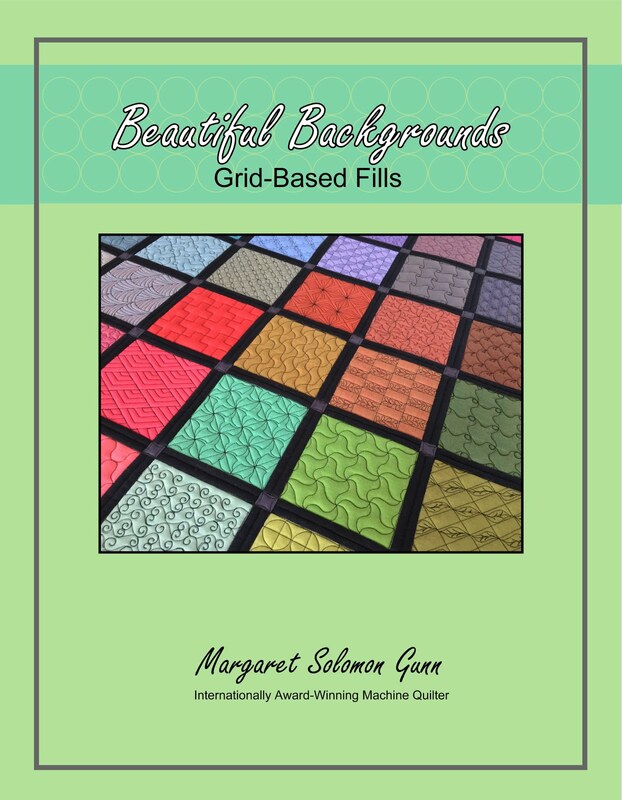 Next time you are working on a quilt that needs an all-over background filler, consider ditching the old standby micro-stippling for something else. I have done my version of the McTavishing here. Petite feathers fill the 1" triangles, and half inch stripes drop down from the mini-swags on the border. I'll post a full set of pictures in a month. There's a lot happening right now at my house. The renovation is winding down. Still awaiting the countertops, but the last dining room box was unpacked last night, and all plastic is officially off of the floors. I need to decorate walls, but this quilt is part of that. And at the moment, I am readying it for the show it is going to next month. It has been 98% done for months now. This week I stitched on the hanging sleeve and finally added these little forget-me-not flowers. I went through about 4 perturbations on how to make a bad little flower before I settled on these. Go figure, these were the ones from Karen Kay Buckley's original design that I thought I was not going to use. I guess I figured I would add my own flair to the center block by creating my own little flowers, or so I thought. But I lack the energy for trial and error right now. I planned them to be a peachy color as well, but last summer I already made two in the light blue, si it was simplest just to make 2 more the same rather than 4! Could be lazy?...yea, but the little blue flowers aren't all that bad. They are made from 2 circles of fabric (the back circle is actually aqua), and then embroidery floss is used to cinch them in to a flowery shape. The teeny-tiny seed pearls hide the floss. Then the ultimate in lazy - they are glued to the quilt (gasp!) - an heirloom quilt with glued on flowers. Shock! I just didn't want to see stitching on the backside and want the flowers to keep their dimensional look with floppy petals. Now, a label, and some good photos and I think "Intertwined" is ready for delivery. Duties call. I have taken my quilt off the frame so I can quilt 4 quilts that are due in 3-4 weeks. I spent 12 days playing mostly freehand-fun with this one. It was liberating while mind-boggling all at the same time. My mind thinks in orderly and symmetrically. I love using templates because they generate perfect lines and equal spacings. This was challenging from that perspective. I know I have several things left unfinished on this, but it was done enough that I could safely remove it and finish them later. This weekend we have a small mudroom to lay ceramic tile in. It's a doable project, hopefully. My right arm has nasty carpal tunnel and numbness in 3 fingers from all of the painting that has been done recently too. Oh the joys of a failing body... We are delighted that our house is coming back to normal. I put away most of the dishes. The table & chairs are once again out of the living room (as the dining room had been a holding zone for everything else. The new rug is down in the new and enlarged living room. All this room lacks is the baseboard heater to be completely finished. Plumber is returning when the kitchen's granite counters are here (abt 1-1.5 weeks). So close...I need to call to get the new dining room furniture delivered now that there is a real room for it. It almose seems surreal that we are only a couple days from being contractor and noise free, and living in a gorgeous new space. Oh, and there's that one issue of the basement. Sigh...I must clean it sometime, and reorganize the stuff, unpack my fabrics, sweep the woodchips, etc. It became usable 2 weeks ago, but I knew better than to clean it until the entire renovation was done. Obviously, I have a good bit still to do, and then there will be rework before it is ready to be shown, but it's now down to the bottom border. Thankfully. It's hard to get the full effect of how the seaglass pieces play with the entire design, both in piecing/applique and in quilting, until it is off. Right now I am just hoping it will look as envisioned, or somewhat close. FYI - I have stitched around over 100 of these appliques. I'm trying for interesting fillers, with meaning and flow, but time will tell there too. I plan to go back over key motifs with a 30 or 40 wt poly thread with a nice sheen, to make them show up more. Here's a small closeup of a paisley filler, learned in an online wholecloth class quilt recently. In a larger quantity, it looks pretty interesting. Today's going to be a noisy day - my living room hardwood is being installed. It's crunch time here at home with the renovation. Getting very close to being finished. My customer quilts are piling up, and will be attacked hard in a couple days when Sea Glass comes off the frame. I know it is hard to get a good sense of where my madness is leading when I only show snippets of the quilting. Sorry, that is somewhat intentional. There will be a grand reveal eventually. I am trying to create am organic look here, with some new quilting motifs for me, ones that can convey the flow of water. Waves and tides to be exact. These are difficult items to "quilt", but hopefully you will see this feeling eventually with this quilt. The picture above show a couple of the "waves" I appliqued onto the watercolor background. Below is just sand. Abstract or art quilts are hard to stitch. 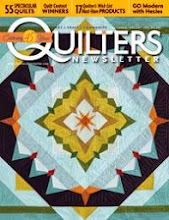 This is a tremendous stretch for me, as my orderly brain thinks better in terms of traditional, and symmetrical quilts. I am approaching halfway through the mid-section of this top. It does quilt up relatively quickly in comparison to other detailed quilts I have done recently since it is 95% freehand quilted. On one hand, it is very liberating. On the other, I have no idea if this will be nice or just 3 miles of thread! 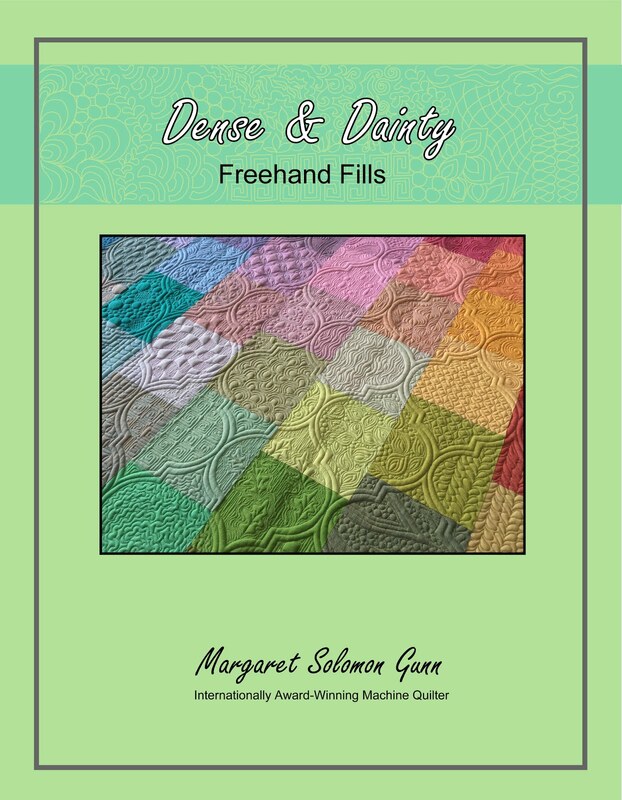 Do you have any suggestions for organic shapes to quilt? Here's a couple more teasers of the body of this quilt. It is all constructed of 60 degree wedge blocks, sometimes called kaleidoscope blocks, in graded batiks. I am doing mostly free-handed quilting in the water-color region. I have done 10 of the 48 blocks so far. 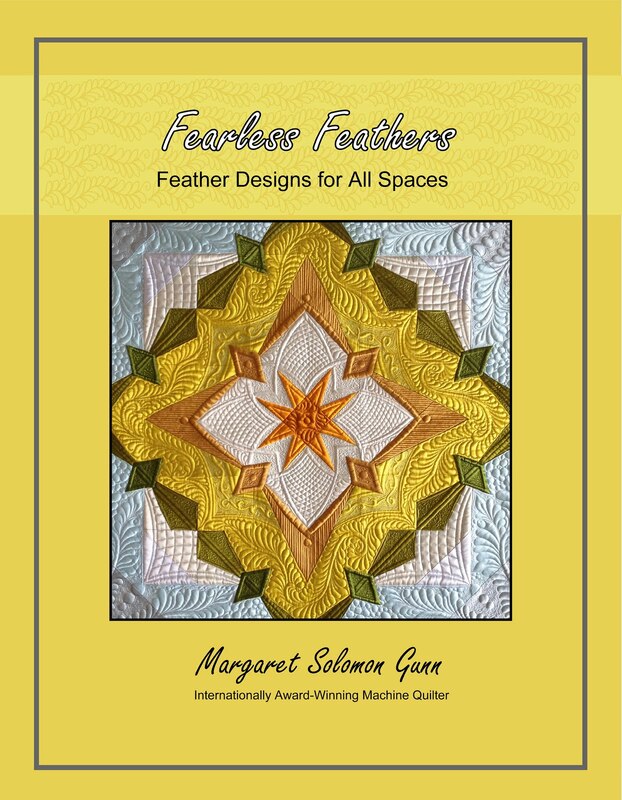 I am selecting more organic looking motifs and fillers to quilt like feathers, water-ripples, swirls, and those shell-ish circles I have stitched out. Since my threads mostly blend, I need the textures to convey the quilt. The ocean area of the quilt is proving nearly impossible to get a good picture of. For one, the darker fabrics just don't show the texture well, and there really is not too much here besides different fillers. It looks better than what this picture is showing, trust me. I probably don't have the restraint to keep the quilting on this quilt only limitted to snippets until it makes its way to it's first show (targeted for the fall), but we'll see. So far I have only stitched out most of the top 7-1/2" border. Tomorrow I get to dive into the body of the quilt. It's a tremendous departure for me in terms of style and colors. Blue is not my norm, nor are non-traditional, non-symmetrical quilts. Despite the juxtaposed highly symmetrical border, the quilt ought to stitch faster since it will be done predominantly free-handed, with limited ruler use. 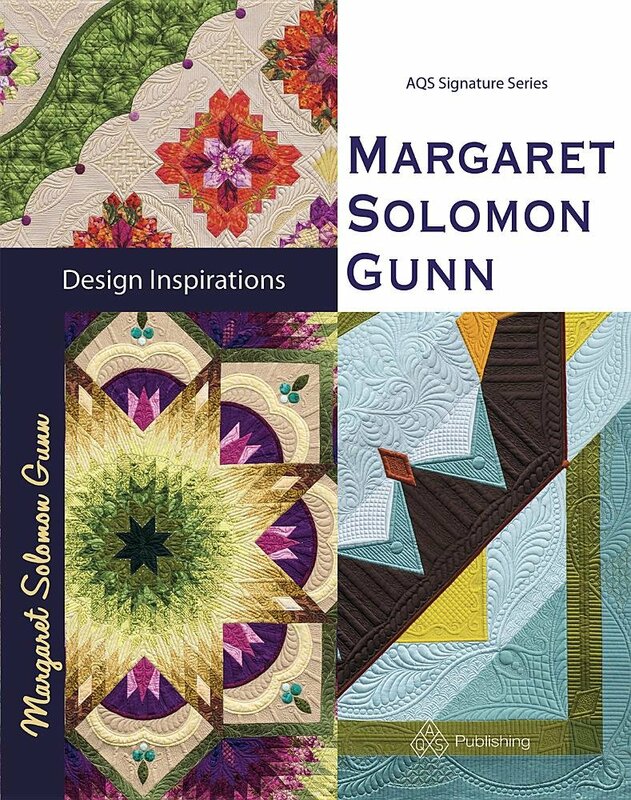 I'm still hoping to throw in some of the tricks I picked up at MQX, both from my classes, and from staring at 200 awesome quilts. My borders are symmetrically asymmetrical. Is that an oxymoron or what? 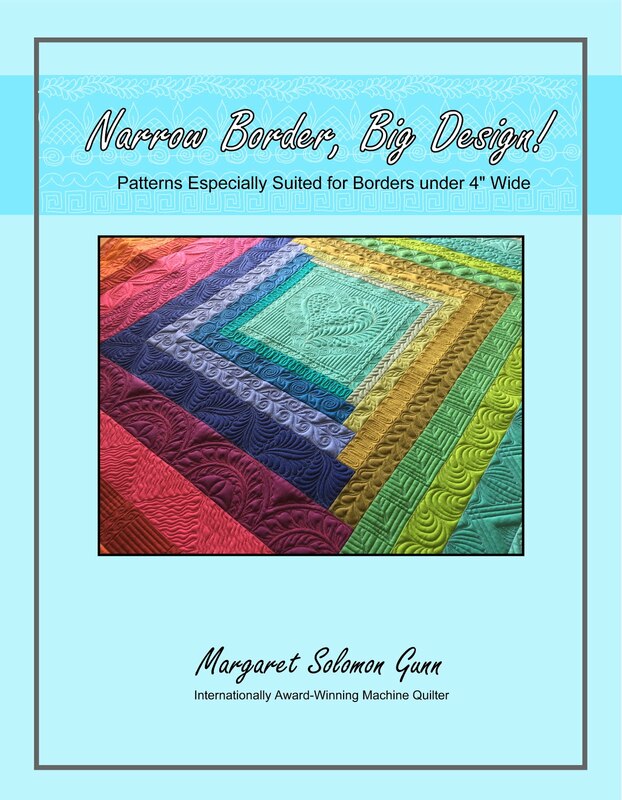 I will have opposing corners of the quilt with a scalloped border, so I have made the borders themselves different too. I make a very clean and what I think is high-quality binding, but I am in search of those missing judges points, so I am thinking outside of the box so to speak, hoping that this variation might catch their attention. The title of this quilt is "Sea Glass", so the border quilting was designed to mimic waves. Some of the space in the picture below is still not stitched. Or I should say I am on the fence as to what I want so rather than stitch, then pick, then restitch, I am waiting. It will likely just be a filler of sorts. At this point, I am extremely happy with the progress, even if this 3.25 square feet of quilting took 5-6 hours to stitch. Despite the other adventures of the weekend (painting an entire downstairs), I finally got this quilt off of the frame. I love how it turned out, but sadly don't have my usual spot for photographing the details of the quilting, on account of the construction. It will be lovely hanging in the Lowell Quilt Festival in August. Sandy in TX always does a fantasticly technical job of assembling quilts with nearly all perfect points, and textbook flatness & squareness. If the binding is half as good as the quilt, she'll do well with this quilt in the show. I'll try to get some more pictures to show, but that is all for now. I have one of my quilts loaded to quilt on for a week or two (until the darn paintbrush calls my name again!). Yes, that's what I need right now. I think the picture below of how I started dinner for this evening says it all. That's the dirty, dry-wall scrap covered steps to my house, and the meager ingredients for dinner. I have so little confidence that this will be remotely edible. As some of you know, my house is undergoing an addition and renovation. The entire kitchen has been moved and there is nothing but a fridge and a disconnected stove in there right now. The walls went up 2 days ago and are being spackled and finished now. I have been mighty patient throughout this process, which started with an incredibly long winter, breaking ground several weeks later than we'd hoped, having our original POS (you figure out the acronym) builder quit after he dug a hole in the backyard for the foundation. We did get a better builder that we know personally in a very quick period of time, and his work has progressed better & faster than I could have hoped for. But this process is starting to take its toll on me now. Something in me snapped last night. I realized I am sick of this now. I want to sew. I want to take my kids to Boston as we'd planned months ago. Thanks to a Morton's neuroma in my foot that is flaring up, this has been on hold. I want to eat food off of real plates, with something other than plasticware. Hell, I want real food and not things out of a box. We have no seasonings for anything I cook. Everything in the house is covered with a layer of silky dust, or saw dust as was the case with the crock pot. I am amazed at my in-laws that have yet to offer to help with a single thing. Like bringing us a meal would kill them, or watching the kids one day. Seriously. My mom's been helpful, but she's having knee surgery next week and all help will undoubtedly cease. Then as if our fate's not rough enough, she's going with my nieces to the beach for a week. I have the ceiling of an entire 1100 square foot downstairs to paint this weekend or Monday, and then the walls. If they are not done sanding the walls Friday, I may get stuck doing this all next week by myself. With a 4-year old home. Hello! I do need help. I asked my husband to take (No, I told him he'd take a day off if it went to next week) a day off next week to help, and his reply was "don't know if I can". Horseshit. Make it happen. Really, what's it about that having "junk" that makes men think that they can be indifferent to helping with well, absolutely anything? Does he think living through this process everyday is a joy? Oh, and the lawnmower died a week ago, and the front yard is knee-high, he won't go to ask about borrowing one until there's freaking rain in the forecast. Need I say more. I've had it and I want out.